The Dogana di Mare and Santa Maria della Salute viewed from San Marco. Like most buildings in Venice, the Dogana had to be made to fit on an irregular parcel of land, and the 1682 architect, Giuseppe Benoni, constructed a huge, long, low, and rather plain, triangular-shaped warehouse. Benoni was probably selected for the project over Baldessare Longhena, architect of the Salute (who also made a bid), for his engineering expertise. Benoni had advised Longhena on technical points of engineering during the construction of the Salute. Anyone who has spent any time “messing about in boats” (in Kenneth Grahame’s phrase) can see that the Punta della Dogana is in an especially vulnerable position, constantly assaulted by storms, currents, and tides. Left to their own devices, the canals would soon remove this fragile pointed spit. Consequently, the dogana required constant maintenance. In 1835–38 the Western part was near collapse, and it was almost completely rebuilt. The Dogana di Mare and Santa Maria della Salute across from the San Marco Vallaresso vaporetto stop. Despite the location’s difficulties, it is obviously prime real estate. Yet the big warehouse was allowed to fall more and more into decline, and after its use as a customs site ended it simply sat vacant for many years. In 2007 the city leased the building to the François Pinault Foundation. Pinault, a billionaire French art collector, is co-owner of the Palazzo Grassi, and he has converted the dogana into a contemporary art exhibition space. Japanese architect Tadao Ango renovated both buildings. He left the exterior of the dogana mostly unchanged, but added iron grills on the windows based on Carlo Scarpi’s design for the Olivetti showroom at Piazza San Marco. Fortuna (detail from above photo). A notable feature of the building is the rather goofy weathervane sculpture atop its tower, which, like the San Marco towers, served as a beacon for shipping. A massive gold ball, representing the earth, is supported by two straining Atlas figures. 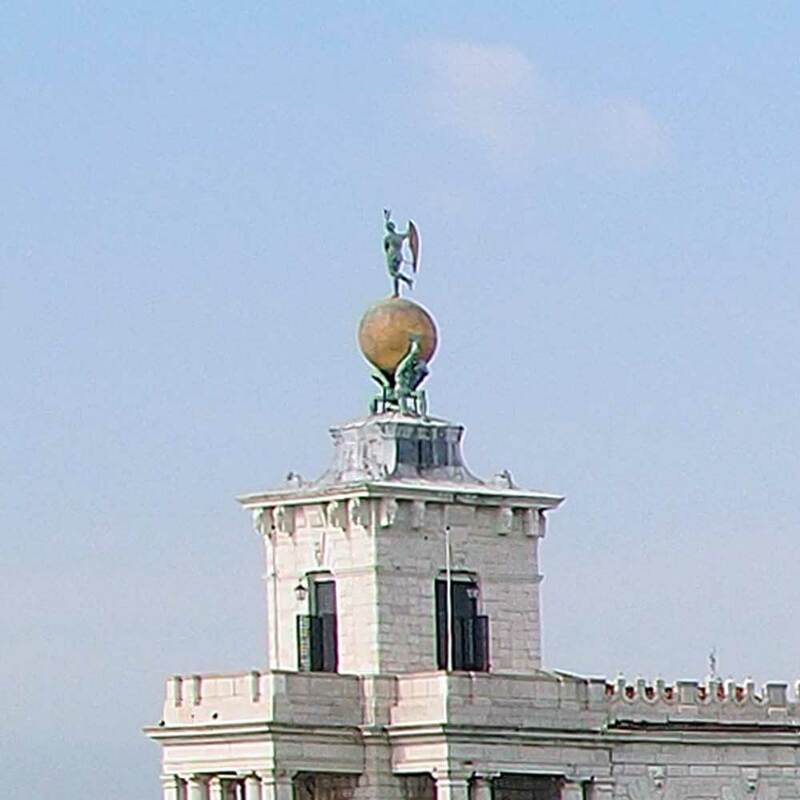 Atop the ball is a figure usually identified as Fortuna, though some say she is Justicia. Count me among the Fortuna camp. It is hard to imagine the city approving a figure of Justice who shifts with the breeze. But for traders, entering the fabulous gilded capital of a rich empire built on trade, an image of Fortune above the customs office seems most apt.